We have state specific work & education requirements, a database of dental hygienist schools in your area, and plenty of other helpful dental assisting guides & articles. Regardless of whether you are still only considering a career as a dental hygienist, having decided that it is and are looking for a school nearby, or have completed the program and are looking for employment, we have all your bases covered. th dentists and other professional staff to help care for the dental health needs of patients. In fact, dental patients will almost always spend more time with the dental hygienist when visiting a dentist’s office than with the dentist. 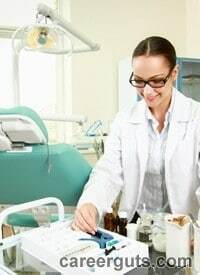 As the hygienist spends so much time with the patient, the hygienist has the opportunity to make a significant positive impact on the patient’s life by educating them on proper dental care. There are two ways that dental hygienists learn the knowledge and skills needed to perform the job: through on the job training and through formal educational programs. However, to work as a dental hygienist, a person has to be licensed in the state in where he or she will work and most states now require a hygienist to have completed a formal education program. For this reason, it is becoming less and less common for hygienists to learn on the job and almost all new hygienists will have to complete an educational program to gain entrance into the dental hygienist profession. In most cases, dental hygiene programs offered by colleges and universities are two year programs leading to an associate’s degree. These associate degree programs combine classroom learning with practical, hands-on training opportunities. In addition to taking courses in dental hygiene, students will also complete courses in related fields such as health and nutrition. Dental hygiene programs are often offered by vocational colleges as well as traditional colleges and universities. In addition to associate degree programs, some colleges and universities offer bachelor level degrees in dental hygiene. Bachelor degree programs cover similar areas as do associate degree programs, but typically go into more depth and require completion of a wider range of classes. Though bachelor degrees are rarely required for hygienist positions, employers will be more likely to offer jobs to those who hold bachelor degrees and these hygienists may be able to advance in their career more quickly than those with an associate degree. Beyond simply working in dental offices, some dental hygienists will also work full or part-time teaching dental hygiene skills to students, others will work in research and some will be employed by dental manufacturers. In most cases, these jobs go to hygienists who hold bachelor degrees and who have at least a few years of experience working in a dental office. Hygienists who are interested in teaching classes in dental hygiene and related fields may need to complete a master’s level program in a related field in order to become eligible to teach at larger colleges and universities. The demand for dental hygienists is expected to be strong in the coming years for a number of reasons. Expanding access to health and dental insurance will result in more people of all ages visiting the dentist or otherwise seeking professional dental care. An aging American population will need more dental care to repair and protect their teeth from loss due to age related wear and decay. The aging population will also result in the retirement of large numbers of current dental hygienists which will also help to fuel the demand for hygienists. Dental hygienists currently average about $70,000 per year, but this figure is also expected to rise with the increasing demand for qualified hygienists.